I know, I know, nobody loves a remake. But, if you haven’t seen the 1999 version of Universal’s classic The Mummy, just give it a chance. In a word, it’s fun. It’s got something for just about everyone: adventure, action, scares, romance, big special effects set pieces, period costumes and settings, cheesy comedy and, of course, jokes about camels. This would be my pick for a scary movie to settle in with that the whole family will likely enjoy. 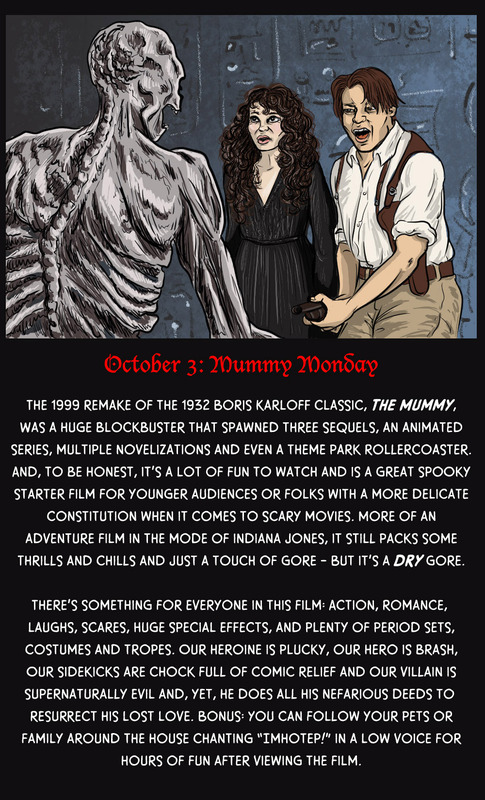 It’s rated PG-13 for some scares and a bit of gore, but it’s definitely something that older kids would both find fun and not be too frightened by. The film really was a runaway hit when it was released, earning $415.9 million dollars worldwide, easily justifying every penny of its $80 million dollar budget. Much of that money was spent on lavish sets built both on location in Morocco and the Sahara desert and, for the underground tomb scenes, at Shepperton Studios in the UK. A good portion of the film’s funds were also spent on cutting edge special effects that blended traditional practical effects and make-up with digital animation techniques. A fine cast really put this production over the top. Our hero, Rick O’Connell, is played by Brendan Fraser and our plucky heroine (and librarian!) Evelyn Carnahan is portrayed by Rachel Weisz. Arnold Vosloo takes on the titular role of eternally cursed Egyptian high priest, Imhotep, doomed to pine forever for his lost love, Anuck-Su-Namun (Patricia Velasquez.) Comic relief comes in the form of Evelyn’s tipsy coward of a brother, Jonathan, played by John Hanna. Though my personal favorite character is the slimy human servant of the mummy Imhotep, Beni (Kevin J. O’Connor) whose lust for gold and riches leads him to some really bad behavior. The film was not without its perils to produce. Snakes, scorpions and sandstorms as well as constant oppressive heat, plagued the cast and crew during filming in the Sahara. And poor Brendan Fraser was nearly killed for real during a scene where our hero narrowly escapes being hung in an Egyptian prison. The 1999 Mummy is not without its flaws. The special effects can be a bit over the top. And it definitely borrows some pretty gross stereotypes from the old classics of the past regarding its Arab characters (they smell, they cheat, they’re buffoons.) Some reviewers found it cheesy (it is but cheese is delicious) and full of cartoonish characters (it is but cartoons are fun) but, really, it’s got pretty much all you can really ask for from a basic popcorn flick. Universal is planning a remake of this remake, set to screen in 2017, so we’ll see if they can improve on the already pretty enjoyable formula of sand, scarabs and scares.